calliprinos, callos, καλλοϛ, beauty; prinos, πρινοϛ, a tree, variously ascribed to Quercus ilex, Quercus coccifera, Ilex aquifolium; beautiful oak. The different Hebrew words used for oak in the Bible (O.T.) are "êl", "êlon", "îlan", "allah", "allôn", and "êlâh" or "âlâhim" (see: pistacia). The standard author abbreviation Webb is used to indicate Philip Barker Webb (1793 – 1854), an English botanist. 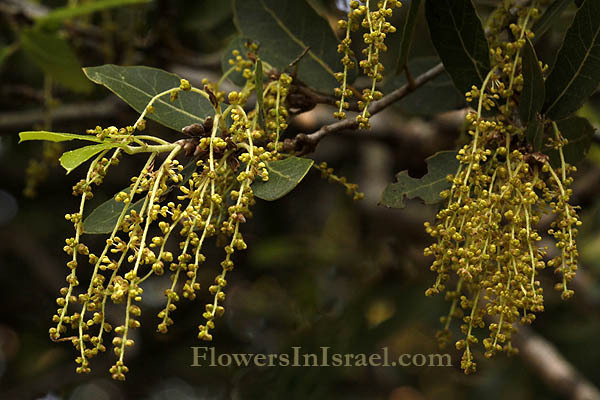 The Palestine Oak (Quercus calliprinos) is closely related to the Kermes Oak (Quercus coccifera) of the western Mediterranean, and is treated as a subspecies or variety of it by some botanists. 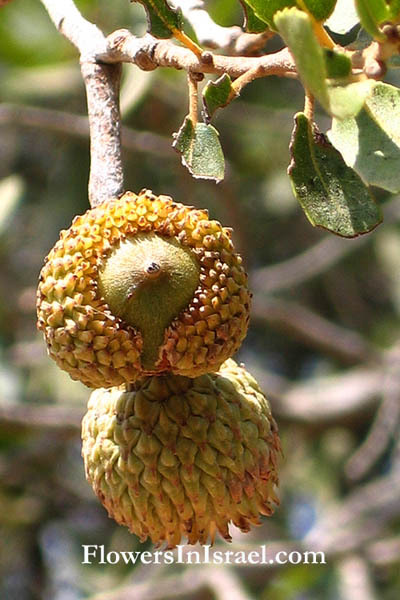 The Kermes Oak is distinguished from it by its smaller size (usually shrubby, not over 10 m) and smaller acorns less than 2 cm diameter. The Quercus calliprinos is the most predominant of the three oak species growing in Israel; the others are the Tabor (Quercus ithaburensis) and Aleppo (Quercus infectoria) oaks. Apart from the Quercus calliprinos, the dominant constituent of this oak forest, are the Pistacia palaestina, Laurus nobilis, Arbutus andrachne, Crataegus aronia and Ceratonia siliqua. The pine trees form the upper story of the forest while the Quercus calliprinos and other evergreen shrubs form the lower one. A Quercus calliprinos forest grows in the areas at an altitude of higher than 200 meters and in the damper parts of the mountain. 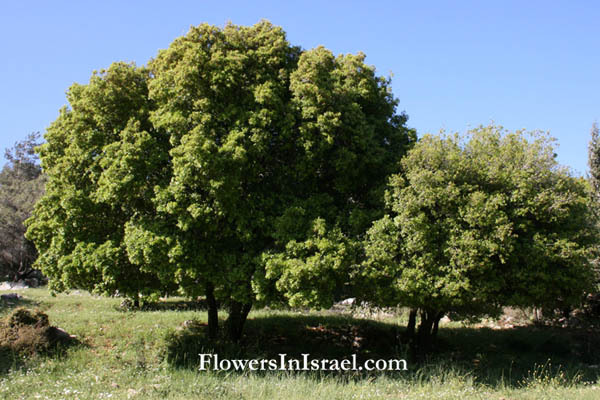 There are beautiful groves on the slopes above Kibbutz Yagur, near Nahal Kelah (known as Little Switzerland), and in Keren Hacarmel. The trees are relatively small and have only one trunk. The leaves are stiff, shiny dark green with sharp spines around the edges. 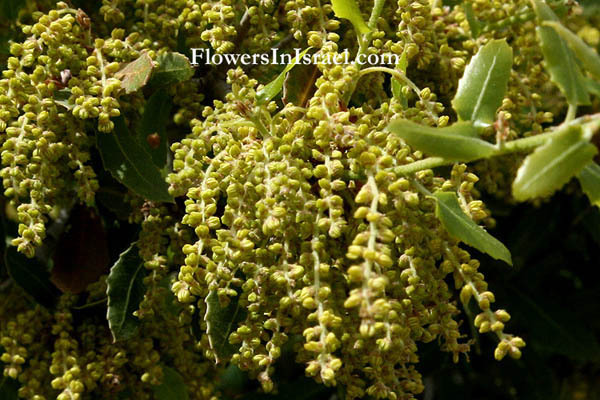 On the same tree are male and female flowers: The male flowers grow as a catkin, a long cylindrical cluster of small flowers without petals. 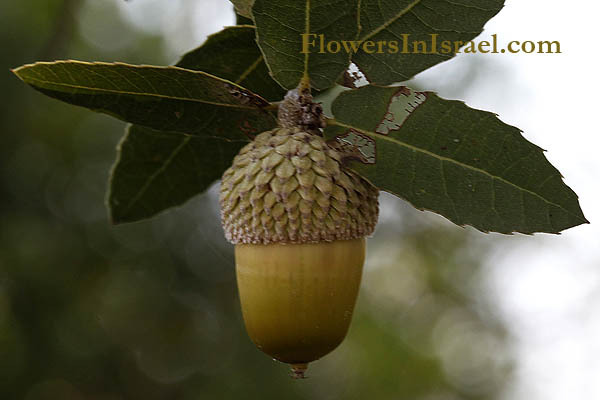 The female flower grows as a nut called an acorn, borne in a cup-like structure known as a cupule. Oaks were one of the sources of tannin necessary for tanning hides. Tanning is mentioned in Acts 10:6. The Kermes Oak was historically important as the food plant of the Kermes insect from which a red dye was obtained and used toward the end of the second Holy Temple (70 CE). The color red, translated as 'scarlet,' or 'crimson,' in Hebrew is usually referred to as 'shani' or more fully as 'tolaat shani.' (In Chronicles, the color is referred to as karmil: "with purple and blue and crimson yarn", II Chron. 2:6,13). The "scarlet worm", Tola`ath shani, "scarlet," Cermes vermilio is a scale-insect which feeds upon the oak and it is not a worm. The female is wingless and adheres to its favorite plant by its long, sucking beak, by which it extracts the sap on which it lives. After once attaching itself it remains motionless, and when dead its body shelters the eggs which have been deposited beneath it. The males, which are smaller than the females, pass through a complete metamorphosis and develop wings. The dye is made from the dried bodies of the females. The word 'crimson' comes from kermes, although the color produced was more of an orange-red. The Cermes vermilio also gave rise to one other word for red, vermillion (Latin "worm-colored", from vermiculus, the Latin term for the kermes). Vermilion, in Hebrew shashar, also appears two times in the Bible (Ezek. 23:14 and Jer. 22:14). This red color was early known; "…and took a scarlet thread" (Gen 38:2). It was one of the colors of the ephod (Exo 28:6), the girdle (Exo 28:8), and the breastplate (Exo 28:15) of the high priest. It is also mentioned in various other connections (Jos 2:18; Sa2 1:24; Lam 4:5; Nah 2:3). A scarlet robe was in mockery placed on our Lord (Mat 27:28; Luk 23:11 Come now, let us reason together," says the LORD. they shall be like wool (Isa 1:18). Now Deborah, Rebekah’s nurse, died and was buried under the oak outside Bethel. So it was named Allon Bakuth. Gideon went inside, prepared a young goat, and from an ephah of flour he made bread without yeast. Putting the meat in a basket and its broth in a pot, he brought them out and offered them to him under the oak. and rode after the man of God. He found him sitting under an oak tree and asked, “Are you the man of God who came from Judah?” “I am,” he replied. [ Psalm 56 ] For the director of music. To the tune of “A Dove on Distant Oaks.” Of David. A miktam. When the Philistines had seized him in Gath. Be merciful to me, my God, for my enemies are in hot pursuit; all day long they press their attack. “You will be ashamed because of the sacred oaks in which you have delighted; you will be disgraced because of the gardens that you have chosen. And they will know that I am the LORD, when their people lie slain among their idols around their altars, on every high hill and on all the mountaintops, under every spreading tree and every leafy oak—places where they offered fragrant incense to all their idols. Of oaks from Bashan they made your oars; of cypress wood from the coasts of Cyprus they made your deck, adorned with ivory. “Yet I destroyed the Amorites before them, though they were tall as the cedars and strong as the oaks. I destroyed their fruit above and their roots below. Wail, you juniper, for the cedar has fallen; the stately trees are ruined! Wail, oaks of Bashan; the dense forest has been cut down!